The Integrated Care Pioneer programme (“Pioneers”) aims to effectively show how integrated care could be implemented in a given locality, and was supported by funding from NHS England. The challenges faced in integrating and coordinating health and social care services, and doing so across public, private and voluntary service organisations, requires more than technical solutions to create system-wide change. If Pioneers are to be at the heart of changing how we care for those who most need support, then they will need leadership that challenges our existing perceptions. A tailored offer of support was made to each Pioneer place, sponsored by the Systems Leadership Alliance, to help them focus on delivering care which really changes people’s lives. At the start of the work, the Leadership Centre wrote to all the Pioneer sites detailing the support on offer, you can download this offer above. Given the experience of other whole system initiatives, the offer to Pioneers was crafted specifically to focus on real work drawing on the perspective of professionals, citizens and service users. The programme of support was designed according to these principles, helping to address complex and complicated issues not easily solvable by a single organisation or person. In order to identify and tailor the support to each Pioneer area, representatives from the Leadership Centre began each project with a discussion with the senior leadership in each site. This enabled the Centre to help the site consider what work may be necessary to achieve breakthrough on the issue identified. Based on the outcome of the scoping session, we were then able to identify a Systems Leadership Enabler who may be best placed to work within the Pioneer site, given the issue they had identified, the experience of the Enabler and the approaches which may be explored to integrate care. Each Pioneer site was also able to take advantage of national events throughout the duration of the project, which were used to actively promote learning between areas of the country on a similar leadership development journey. Advice and support was available from international experts in systems change, through the provision of masterclasses, webinars and “phone a friend” interventions. 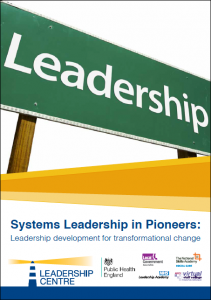 A number of the Pioneer sites had previously taken part in the Systems Leadership Local Vision programme, allowing them to employ their learning and insight in another national initiative of local importance – shaping an approach that will help them lead change across their local and national systems. Each of the Pioneer sites identified areas of work which differed in both approach and scale, and took into account existing relationships. To fully understand the scale and impact of the Pioneer work, NHS England produced yearly reports into the effectiveness of the work undertaken. You can read the reports on the Pioneer work, titled ‘Integrated Care Pioneers: One Year On’ and, ‘People helping people’, here.